The special hook-up between vibraphonist Joe Locke and pianist Geoffrey Keezer is based on shared assets like chops, listening skills and a gift for communicating the joy of making music. 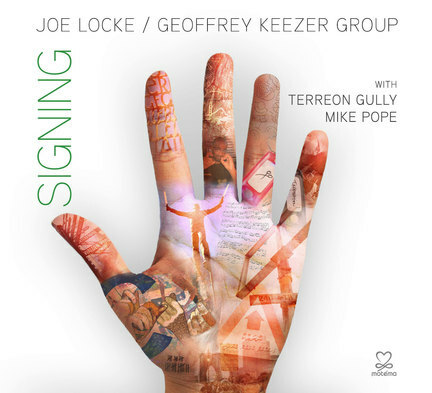 Signing is the second record by a quartet including bassist Mike Pope and drummer Terreon Gully. There is an eternal paradigm for bands with this instrumentation. But the Locke/Keezer Group is very different from the Modern Jazz Quartet. MJQ was arch and minimalist; Locke/Keezer is lush and hot-blooded. What the two ensembles share is the magical, complementary sonorities of the vibes/piano blend. Locke/Keezer can make complex material sound suave and tricky time signatures flow. Keezer’s “Darth Alexis” ascends and teeters, then slams. Locke’s “Her Sanctuary” is a metric maze including 13/8. When they improvise, both players are always bursting with ideas. They have many ways of interweaving their two voices, in headlong unisons or meticulous counterpoint or juxtaposed contrasting paths. Locke’s “The Lost Lenore” is a simple figure, a yearning question that comes back around again and again and gathers sadness in the waves of Locke’s vibrato. They play two familiar songs. Imogen Heap’s dead-slow meditation, “Hide and Seek,” is a literal transcription, yet it is transformed when restated in their bright commingled treble language. John Coltrane’s “Naima” is lit up with a long new prelude and a radical rearrangement. Gully and Pope are creative, proactive, essential collaborators. Pope, while threading interesting electric basslines all through this recording, also managed to engineer and mix its excellent sound. And there is one other difference between MJQ and this band: MJQ had 40 years to work on their empathy. The members of Locke/Keezer had not played together in several years, did not rehearse and nailed Signing in mostly first takes.